I have visited Royal Baking Co.'s(RBC) Viman Nagar outlet and enjoyed the food, desserts, and shakes they had to offer. And I knew I couldn't miss going to their newly opened outlet at FC Road. Keeping true to their theme of blue, white and hint of bright orange, the ambience of this outlet is very relaxed and comfortable where you can sit back to enjoy the good and pocket-friendly food they offer. 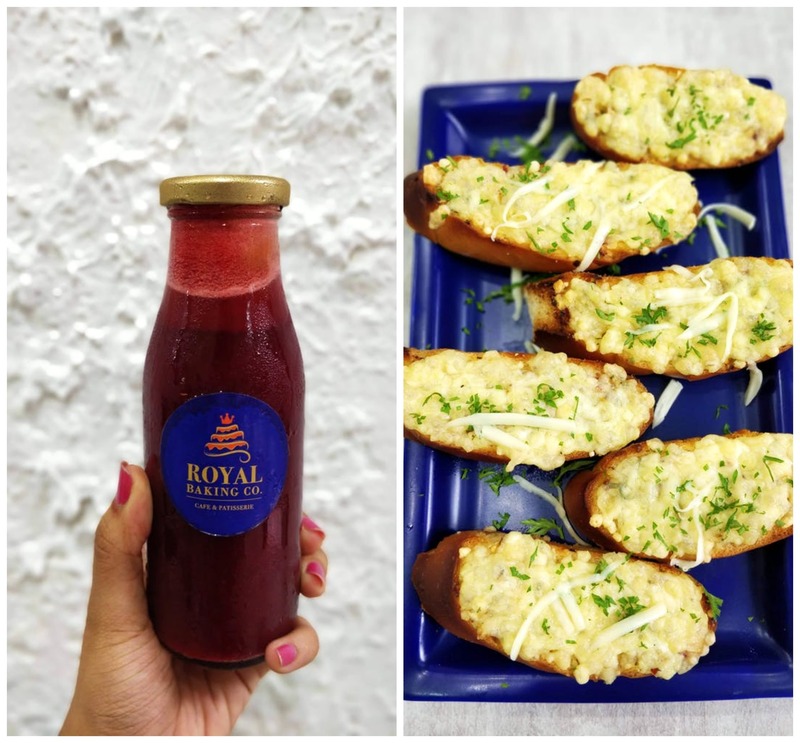 Other than their cakes and pastries, RBC is known for their bottled shakes and juices which are nothing short of drool-worthy. I tried the following drinks and loved them all, a few more than the others though. (LOL!) Wildberry shake - HIGHLY RECOMMENDED Blueberry cheese shake - Highly Recommended Peach iced tea Pink lemonade Power juice Banana caramel shake From the food section here's what all I tried: Honey chilli fries - I love the honey chilli fries for the sole reason that they are crispy even though they are drenched in the sauce which is perfection. Cheese garlic bread - Undoubtedly one of my favourite garlic bread with cheese in town. The bread was soft, the flavour of garlic was in the right proportion, and there was just enough cheese. Pink pasta - Just your regular penne pasta in a pink sauce. Nothing to fault out in this one. The portion size was good enough for two people post an appetiser and followed by a dessert. Schezwan wrap and Ramen wrap - I loved both the wraps, but the Ramen wrap (noodles in a medium spicy sauce) a little more than the Schezwan one (paneer and veggies in schezwan sauce). For desserts, we tried: Apple pie tart Chocolate tart Belgian chocolate pastry Dark chocolate pastry I loved both the pastries. They were dark, decadent, and toothsome.